Yemen's Currency is the Yemeni Riyal (YER) See below for link to exchange rates. Unfortunately, qadr Allah, when we were in Damaaj I didn’t have my trusty phone camera so I do not have personal pictures of Damaaj. A maktabah is an office/school supply store. What is a maktabah like? Maktabahs range in size from say a small bedroom(maybe even smaller) to the giant ones like Al Jeel Al Jadeed (two locations on the diary, one of which is three stories (basement, ground floor and one other floor). What does a maktabah offer? Some maktabaat also sell decorations for gift bags and small, cheap gifts. You may also find cheap toys, beauty aids, clocks, wall hangings, books, newspapers, and magazines, depending on the store. At some of the smaller/medium maktabahs you can get copies made for around 10 riyals per page. Some maktabahs focus more on school and office supplies while some focus more on cheap gifts and decorations. Side note: I had self studied a little Arabic before moving abroad and on one of my first trips to a maktabah, I asked for “shareet” thinking that was like scotch tape. Shareet is like a cassette, and lisqa is adhesive tape, lol. Insha Allah, I will try to add more items to the list. I still don’t know what a stapler or staples is called. 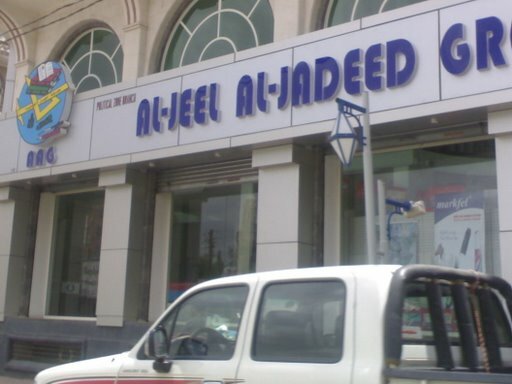 If you are lookking for things such as paper fasteners (we called them brads when I was in school), binder clips, and bigger office supplies (laminators, etc) try a store like Al Jeel Al Jadeed. Al Jeel Al Jadeed Website: http://aag-ye.com/en/index.aspx (It’s in English and looks way better than it had when I orginally accessed it, although it still seems under development). Here is a list of their branches: http://aag-ye.com/en/Branches.aspx Also includes pictures of a few of the branches. Also, you will find more American style notebooks at stores like Al Jeel Al Jadeed or even grocery stores like City Mart and some of the small baqaalahs sometimes carry school supplies. As of this writing, Shumaila Hari’s schol supply section is not that great, but City Mart’s is pretty good. The school supplies are upstairs at City Mart. As with the itasaalat and baqaalun, maktabahs are numerous. An itasaalat is a store from which you can make international or local calls. What does an itasaalat look like? To make a call, you simply go into a booth and dial your number on the phone. A meter inside each booth keeps track of your toll. When you have finished your call, note your charge and go to the cashier (All the meters are networked to the cashier). An itasaalat usually also sells phone cards for mobile or land line phones. When using an itasaalat to make international calls or calls to cell phones, be sure to keep an eye on your charge as these types of calls run up quickly. Also, you should probably know the country code for the country you are calling. Some itasaalat cashiers may know the codes or a chart may be posted in the booth or on the wall, but just don’t count on it. Some words for phone in Arabic are haatif or telefone. Mobile phones are called mo-bile, pronounced as in British English, not as mo-bil in American English. Itasaalat, like the baqaalun (see previous post) are all over the place. I don’t think you will find individual phone booths here as in the West, but rather the itasaalat. I like to shop in the major western supermarkets, but there are many benefits of shopping at a baqaalah—neighborhood grocery store. Baqaaluun (plural) are abundant here. On any given street, there may be several. When I walk out of my building there are at least 5 in the near vicinity. Although prices in the baqaalah (especially ones in neighborhoods off the beaten path–or shall I say paved path) may be a little more expensive (10-100 riyals for example), there are many conveniences to shopping at them. The baqaaluun typically range in size from that of a small bedroom to that of a small convenience store. Some have a counter prohibiting entry into the store (so the grocer has to get your items); some give you free reign to walk around and select your groceries. The majority of the smaller baqaaluun basically all look alike with shelves of goods along the wall. The larger stores may have aisles. Don’t be fooled by the small stores; they can really pack in more than you might think. If I had to shop exclusively in my neighborhood, I could probably get 90% of what I want/need. You can find canned goods, beverages, (sometimes in refrigerated cases), cleaning supplies, small household/kitchen goods, sometimes a freezer of frozen foods, beauty and hygiene products, plastic goods, etc. As I mentioned earlier, they are everywhere, so you don’t have to go far or even take a taxi to get there. You can send your older children that speak Arabic to pick up things for you. If you purchase large or a lot of items, some stores may have a wheelbarrow to carry your items home in. Ever need just one or two eggs for a recipe but didn’t want to purchase a whole dozen? In many stores, you can get just one or two eggs instead of buying a dozen (or a flat of 30 which is how they come, instead of in dozens). You can buy just one diaper or how ever many you may need if you can’t afford a whole pack at the time. You can buy 1 piece of bread and one triangle of cheese for a quick, light lunch. If you build up a repoire with your local grocer, you may be able to sajjil (buy things on a tab) if you don’t have the money. Just be sure to get a written receipt (faturah) when you pay it back and keep track closely of what you are getting and the total. Typically smaller stores will not give you a receipt (faturah). If you shop there enough, it may be easy to take back things that are damaged. If you frequently shop at a baqaalah, they may give you special deals, discounts, and maybe even freebies. Be sure to stop by TJ’s new feature, “Around the Town in Sana’a” for a look at different types of establishments (businesses), services, etc that you will find in Sana’a. Great for those new to Sana’a, to get an idea of “how stuff works” in Sana’a’ or where to go to find the stuff you need, insha Allah or those just interested in learning about Sana’a/Yemen. PLEASE NOTE: I am no longer in Yemen. I'm making major changes in the structure of TJ. Instead of the pages below, all information will be contained in posts, insha Allah. As I convert a page to a post or posts, the page will be deleted. What are prices like in Yemen? What Does Yemen Look Like?